Based on 7GG 1/8 scale. Easily change size and color by simply adjusting the stroke. To make it easy for sweater designers, we’ve created over 167 Illustrator sweater brushes and swatches for the most commonly used sweater design stitches! Our set includes cable stitches, jersey, purl, pointelle, sweater ribs, etc – basically everything you need to get those sweater design fashion sketches done in a snap! Pre-made Vector brushes and swatches make it easy for sweater designers to draw detailed sweater design fashion sketches quickly and efficiently. Save hours of sketching time and quickly apply sweater stitches to your fashion design sketches with a single click! Almost every sweater brush & swatch comes in 2 or more versions, giving you more design freedom to show various colors and textures. All brushes can be re-sized and re-colored by simply choosing the desired stroke weight or color. All Vector Sweater Brushes are drawn approximately at 1/8th scale (8x’s smaller than actual size), so it’s easy for you to create the correct cable/stitch proportions in your sweater designs. For example, a 1pt stroke weight will show a cable at 1/8th of its actual size. An 8pt stroke will show the same cable at its actual life size. So it’s easy for you draw your sweater sketches proportionately and show enlarged detail sketches as well! Sweater design fashion sketches are some of the hardest to draw because of all the details in sweater designs. Usually fashion knits silhouettes are simple, but sketching stitch details and textures can be really time consuming, especially when you need to make fashion CAD drawings that are close to the actual design. 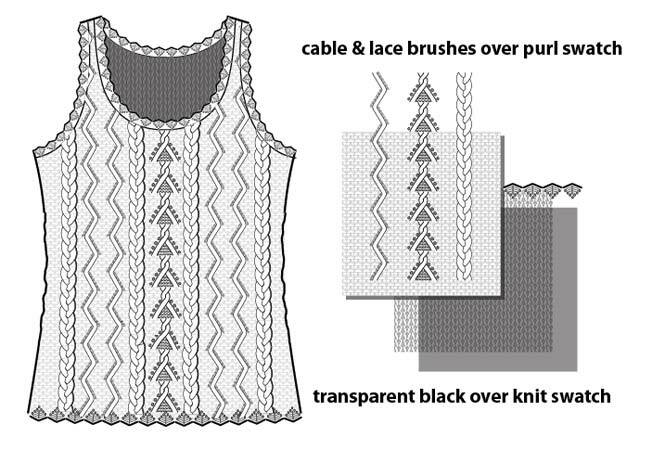 To save time, many fashion sweater designers create Adobe Illustrator brushes and swatches to show cable stitches, pointelle, lace, crochet, rib etc… But, to make a good vector brush in Adobe Illustrator, you need to think of how to make it and how the brush works, then draw it, test, and adjust. The whole process of creating and drawing a perfect repeat of a sweater stitch can take hours, even if you’re good with Illustrator! In Adobe Illustrator, click FILE -> OPEN to open the Sample page for the desired brush set. Strokes of each brush, and fill samples of each swatch are displayed on the pages. Copy the stroke with the desired brush, or copy the fill with the desired swatch, and paste it into the document with your artwork. The pasted brush/swatch will automatically be added to the Brushes or Swatches panel and will be saved with the document. thank you for you interest in our product. Garter (also called purl or reverse jersey) – 2 versions as a swatch. They are all featured on the sales page. Hi I was trying to buy the pack, but it wont work… ?? 100% a fantastic product and extremely good value for money. Would recommend to everyone. Ok this brushes set is my brain child. I spent days, weeks, months on inventing, perfecting, and creating perfectly seamless user friendly brushes. Each one took me hours to sketch and re-sketch over and over until I was satisfied. So if you going to rate the set anything less than 5 stars, please explain yourself. Perhaps there is something I’ve missed. Sweater brushes are very difficult to create in illustrator even for advanced user such as myself. It takes a lot of time. Before buying I suggest to try and sketch 100 brushes, or even 10 for that matter just to so you can fully appreciate a $20 deal. Nevertheless I strive to perfection, so if you’re not fully satisfied, please share. With a current project I’m working on these will provide priceless. – Select the filled shape and click the “Recolor Artwork” icon (color wheel located in the Control Panel) or choose EDIT>EDIT COLORS>RECOLOR ARTWORK from the Top Menu Bar. – Use Live Color to change the desired colors in the swatch and click OK.
– The selected filled shape will reflect your color changes and a new recolored swatch will appear in the Swatches Panel. Very useful brushes. But I am unable to insert color in the sweater swatches. Anybody knows how to fix it? Exactly what I was looking for, and then some! This is a huge help for sock design.